King Eurystheus told Hercules he had to go kill the Hydra. The Hydra was a huge snake with seven heads. Hercules thought, “Well, that sounds easy. I’ll just go cut off its heads with my sword.” But when he was fighting the Hydra, he realized that whenever he cut off a head, two more grew back out of the neck! By fighting the Hydra, Hercules was only making it stronger. So Hercules thought of another plan. Instead of cutting off the heads, he smashed them between two rocks. Then the heads did not grow back, and so Hercules was able to kill the Hydra. 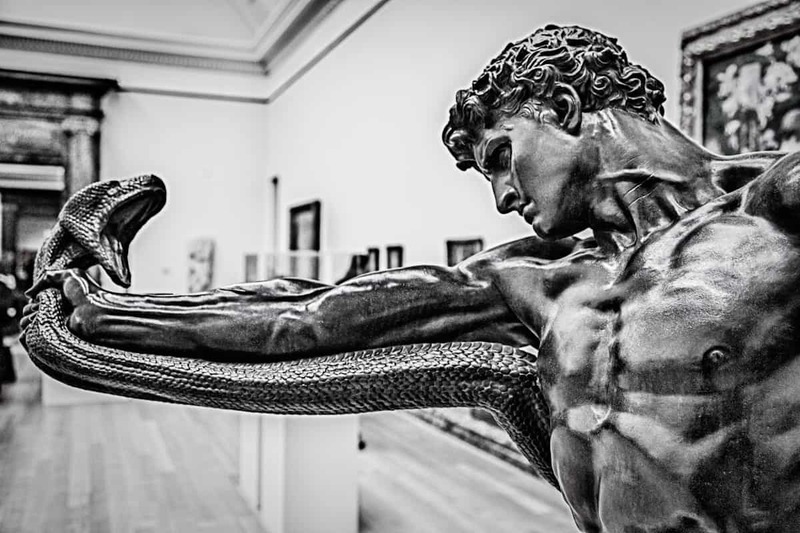 This is not Hercules and the Hydra, The correct title is ‘An Athlete Wrestling with a Python’ by Frederic, Lord Leighton 1830–1896 the only artist ever to be given a peerage (by Queen Victoria) the date of the bronze piece is 1877, and is currently in Tate Britain, London. I know there also is a half size bronze copy in the Walker Art Gallery, Liverpool, England.